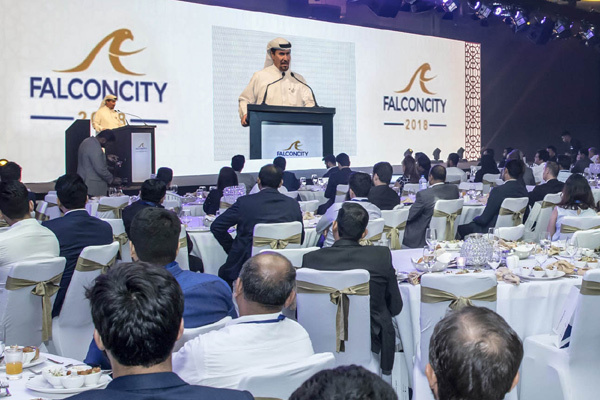 Falconcity of Wonders’ upcoming Eastern Residences villa project drew great interest from brokers at an exclusive event in Dubai. The event, at the JW Marriott Marquis Hotel Dubai, attracted over 500 local and international brokers. This event came as part of a series of activities that FCW will organise for brokers in a bid to spread awareness of the unique features of Eastern Residence North and South in preparation for the sales launch of the project scheduled for September 20 to 23, at the Sheikh Rashid Hall in Dubai World Trade Centre (DWTC). High-achieving brokers who sold the most units in the Western Residence phase of FCW were awarded cash prizes of Dh150,000 and Dh100,000 for first and second places, respectively. The event was held in the presence of Salem Almoosa, chairman and general manager, Falconcity of Wonders, and other dignitaries. Attendees present at the broker event expressed great interest in the unique aspects of Eastern Residences, a gated community featuring spacious five- and six-bedroom detached villas meticulously planned to offer premium quality and durable finishing at unbeatable prices; an ideal home for families of all sizes, said the company. The villas at Eastern Residences include spacious plot sizes, a large multi-use roof terrace with indoor access, wide three-car shaded parking among many other unique features. It will enjoy full access to a large community centre, a community club and a supermarket that are already part of the larger Falconcity master community. Interested buyers and investors have been invited to avail exclusive offers available at the event, including 0 DLD fees and 0 service charges for five years, it said.